Grow Ahead teamed up with the Centre for No-Till Agriculture (CNTA) to fundraise for the installation of learning centres to introduce conservation agriculture to smallholder farmers growing corn, eggplant, and tomato in three communities in the Atwima Kwanwoma district of the Ashanti region of Ghana. After completing one season of hands-on training with CNTA, each farmer is expected to implement what they learn in the program on their farms and share with neighbouring farmers. Since the project was funded, the CNTA team has begun the one-year hands on training process with 41 farmers. 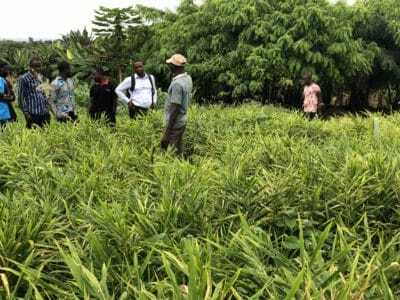 The majority of farmers participating grow food on small plots of land (less than 2 hectares) and employ slash and burn, a method used to prepare fields for planting, which gives crops an initial nutrient boost but kills the soil life necessary for sustained, healthy farmlands. Farmers are also experiencing increasingly frequent unpredictable severe weather events, putting their harvests at risk. Conservation agriculture focuses on building healthy soils by growing diverse crops, keeping the ground covered, and employing no-till (a way of growing crops or pasture from year to year without disturbing the soil through tillage). Many farmers have always burned their fields to prepare them for new crops. However, after visiting CNTA’s facilities and participating in the program, they see first-hand that no-till planting is possible and beneficial to farmland because it supports life in the soil. CNTA’s model uses farmer-to-farmer training as a tool to rapidly and effectively spread conservation agriculture principles and practices that help farmers build healthy soil, thus generating higher yields, increasing income, and producing healthier food. Training and capacity building for small-scale farmers also revitalizes local economies and supports resiliency in the face of extreme weather events. Grow Ahead’s farmer-to-farmer training programs aim to support initiatives like this one. 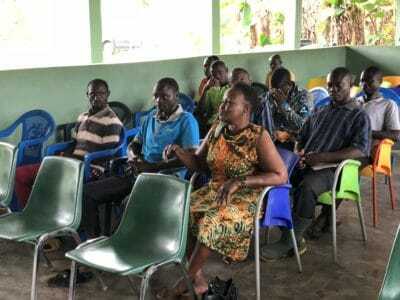 Samuel Amponsah, a farmer that participated in a similar program with CNTA, began incorporating conservation agriculture practices after seeing the success of farmers in his community. Within two years, Samuel’s yields increased by 60% on his two acres where he grows cocoa, maize, pepper, cassava and plantain. “When I used to burn and clear my fields, the soil was swept away by rain and wind. Crops generally do not grow well on bare soil. Using no-tillage, crops grow very well,” said Samuel. Through the adoption of conservation agriculture practices, Samuel increased his yields to surplus levels beyond the needs of his family and was able to sell more crops in the market. This allowed him to reinvest his profits to buy more farmland. Grow Ahead hopes that similar outcomes will be achieved through the program our network helped to fund this year. The CNTA team shared photos from the first few months of implementation. See below!